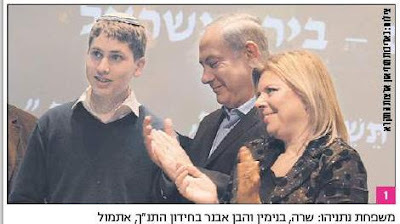 Prime Minister Benjamin Netanyahu's son, Avner, won the Jerusalem District "Chidon HaTanach", (Bible Contest) the other day. "Avner is the latest in a long family line to win recognition for Bible knowledge. - Hagi Ben-Artzi won the International Youth Bible Quiz. Can't wait to see this year's International Bible Quiz. Is good to know that this family wins the district because there are a very nice family and they have many good ideas for improving the district.